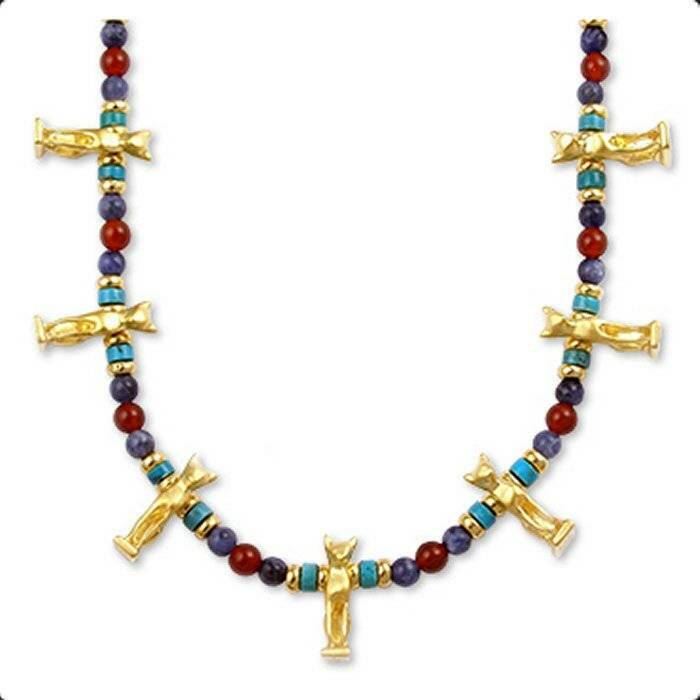 This Bastet Necklace has cat amulets separated with semiprecious stones (turquoise, sodalite, carnelian) and a toggle/bar closure. The amulets are made of pewter with gold finish. Measures approx 16" in length. We ship via USPS Priority Mail - Insured for safety and so that you will have your package in 2-3 days once it is posted, plus you can track it online. HISTORY: Cat amulets were commonly worn on necklaces during the 22nd and 23rd dynasties to invoke the blessing of Bastet. Cats were considered sacred in ancient Egypt. Admired for its virility, strength and agility, it was also the symbol of Bastet, the benevolent cat goddess who represented motherhood and joy. She was often portrayed as a woman with a cat's head. Bubastis, a city in Lower Egypt, was famous for its yearly festival in honor of Bastet and for its great cemetery of mummified cats. Originally linked to the sun god Re. Bastet came to be associated with life preserving power of the sun and the protection of women. Ancient Egypt 940 - 730 B.C. HISTORY: Ancient Egypt, one of the richest and most advanced of the early civilizations, appeared on the stage of history around 3100 B.C. (Dynasty I). Hieroglyphic scripts and tomb decorations document the Egyptians' belief in the after-life, their mythology and deities. Jewelry was often worn as protective talismans. Gold was believed to reflect the life-giving rays of the sun. The color and brilliance of gem stones traditionally determined their value and religious significance. Check out the handmade Egyptian Designs in the Old World Jewelry section!